While hiking in the dry, hot climate of Arizona's Grand Canyon National Park may not be for everyone, hiking trails offer an unbeatable close-up experience of the wonders of this incredible monument. 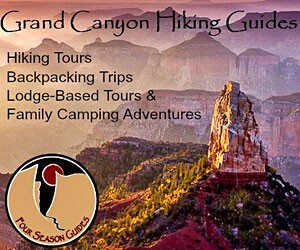 Whether you choose a rim hike or venture into the canyon, there are plenty of challenging options for the avid hiker to choose from. 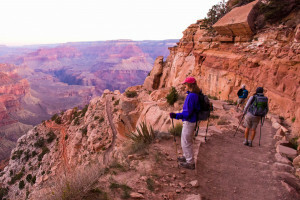 On the South Rim of the Grand Canyon, the Rim Trail provides easily accessible and magnificent views along a paved trail that connects the village area with the quiet overlook at Hermit's Rest. Multiple shuttle bus stops along the way allow you to modify the distance of your walk as you please. The popular but ominous Bright Angel Trail dips 12 miles into the canyon and follows an ancient Anasazi route to a water source for some necessary rehydration. For the hardiest hikers, the Grandview Trail provides the hiking enthusiast an adventuresome scramble to either the Coconino Saddle or past that to Horseshoe Mesa. North Rim visitors looking for milder activity can enjoy a pleasant, paved stroll to an incredible viewpoint on the Bright Angel Point Trail. 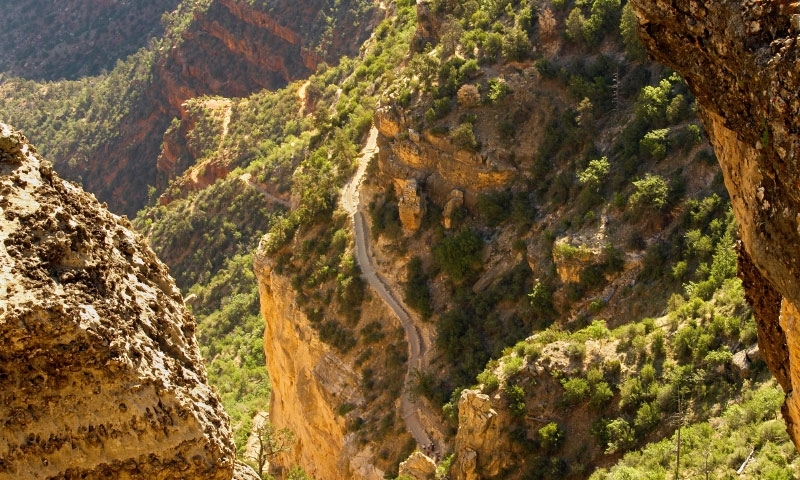 The North Kaibab Trail offers a variety of distances and incredible vistas, including the Coconino Overlook, the Supai Tunnel, and the long, but rewarding trip to Roaring Springs. Over 15 different trails drop into the canyon for an incredible backcountry adventure—but please remember that backcountry permits are required, and that extreme desert weather conditions exist. Drink plenty of water and nourish your body—it needs it!